“I want to let the community know that we do have the capacity to investigate our own,” Tuggle said in a news conference at police headquarters yesterday. • In 2009, Moore, his partner Kendell L. Richburg, and another officer were involved in an incident in which an officer allegedly struck a 63-year-old African-American man in the face with a flashlight, breaking his nose. The city paid Samuel Horne Jr. an undisclosed amount to settle the case. • In 2013, Richburg pleaded guilty to armed drug conspiracy. Richburg gave an informant seized drugs to sell, tipped him off to law enforcement activity on his turf and directed the informant to plant a gun in the vehicle of an unlicensed cabdriver, according to prosecutors. • In May 2018, an off-duty Moore – already suspended for unexplained reasons, but still on the BPD payroll – was with a 36-year-old woman who was shot in the neck in Southwest Baltimore. 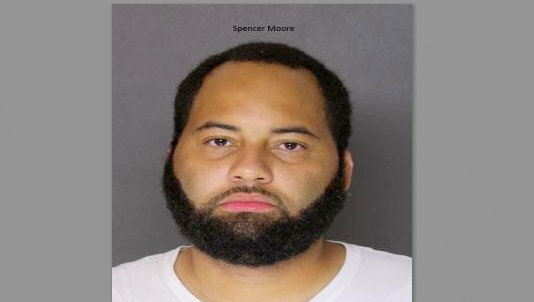 Now Moore, 34, has been charged by Baltimore County police with four counts of drug possession and distribution. According to WBAL, Moore is the son of Baltimore Police Col. Robert Smith. The arrest took place Tuesday after officers observed a man, later identified as Moore, in a parking lot on the 1600 block of North Forest Park Avenue in Woodlawn. Moore was seen exiting a silver Lexus and handing something to a man parked in a white pick-up truck. “A subsequent search of the Lexus revealed three pill bottles containing over 100 Oxycodone pills,” county police said. Moore and Keon Bennett, the driver of the truck, were arrested at the scene. Tuggle was asked yesterday if Moore was on duty when he allegedly engaged in the illegal drug sale. The accused officer had been off-duty – on paid suspension – for several months as a result of “a couple of incidences,” he said. Asked to describe those other incidences, Tuggle declined. Moore, who is being held at the Baltimore County Detention Center, was suspended without pay as of his Tuesday arrest, Tuggle said. The product of a months-long joint investigation involving the U.S. Drug Enforcement Administration and Baltimore County police, as well as city police, Moore’s arrest was the latest incident to highlight the persistent problem of misconduct and criminal behavior by some city officers. “That officer has been separated from the department,” Tuggle said, declining to specify whether she resigned or was fired. Earlier this month, prosecutors charged Officer Carlos Rivera-Martinez with assault and misconduct in a 2016 excessive force incident. Police also identified him as an officer involved in a January 22 shooting incident. In another case that surfaced in July, Officer Calvin Moss was suspended with pay in connection with allegations of domestic abuse. That action came after a Harford County judge barred Moss from carrying a gun amid allegations by his children’s mother that he screamed threats outside the safe house where she was staying. In the case of the 2011 civil action filed against Moore and two other officers, Horne said that he was alone in his car in Park Heights when one or two of the officers approached to speak with him. The other officer entered the vehicle without consent and struck him in the face with a hard, blunt object “breaking his nose and causing a severe flow of blood from the wound,” according to Horne’s account. Online records show Horne was found not guilty of a handgun charge filed as a result of the June 16, 2009 incident, and that other charges filed that day were later dismissed. Last year, Moore earned $80,119 as a police officer, $7,500 of that from overtime, according to online city records.